I've been wondering recently about why MLS owned teams playing in the USL seem to be doing somewhat poorly so far in this 2018 season, so I decided to dig into the data and investigate. 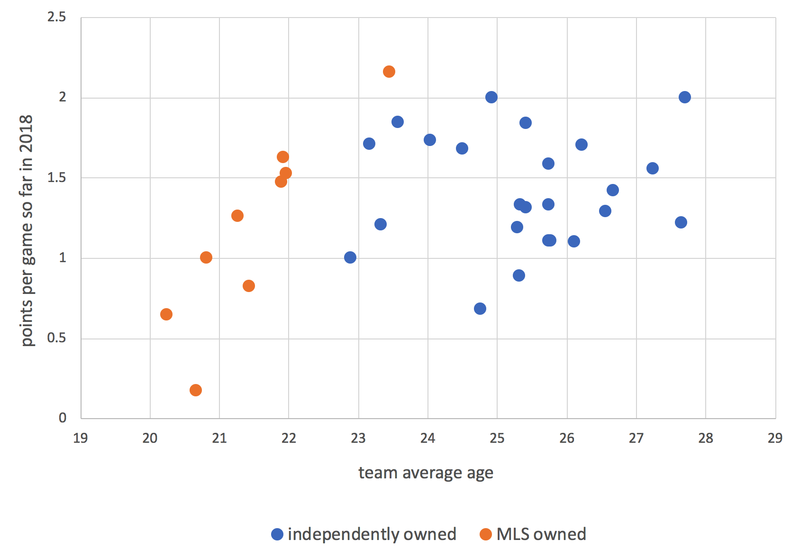 My hypothesis was that these MLS owned teams simply had younger rosters, and that may be one of the factors leading them to perform poorly relative to the other teams in the league that have older rosters. MLS owned teams have significantly younger rosters than the rest of the league by an average of almost four years. I was pretty surprised that the gap for average age was that wide. There does seem to be a slight positive correlation league-wide between team average age and performance. I used the points per game metric as a proxy for performance, since that seems to be the fairest way to compare how teams are doing so far this season when they've played varying amounts of games (as of July 16th, 2018). Check out my extremely rough scratchpad of code and data here on GitHub.